ooo – the cuteness, the tentacle-y goodness! 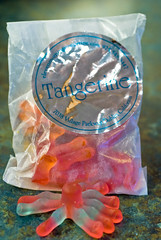 I used to love gummis when I was a kid and lived in Germany – I would eat the little cola bottles like crazy. But octopi? Delightful!